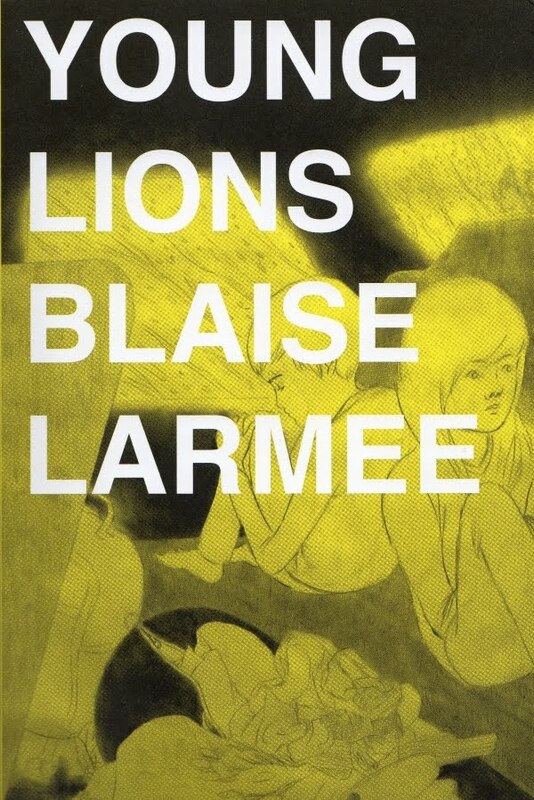 I know little about Blaise Larmee--he has left a trail of writings on the internet containing his thoughts about art. His name sounds kind of fake. Blaise (as in Blaise Pascal, author of Pensées --"Thoughts"?) Larmee (as in "l'Armée"--"The army")... Maybe it's a pseudonym, maybe not. As a thinker, well, he comes across like an undergraduate or recent graduate who is just discovering a bunch of new criticism and theory. He seems excited to be able to put together these new things he's read with his own ideas. His writing feels shallow, even callow, sometimes. His primary venue, Co-Mix, is relatively forgiving and nurturing--contentious, but contentious within a narrow range of argument. When he ventures outside of Co-Mix, as in his piece for The Comics Journal entitled "Trophy Economy," he gets shredded. But it's admirable what he's doing. He's working out a personal philosophy in public. Why he is willing to do this, I don't know. Maybe he is an exhibitionist. But one hopes the feedback he gets and arguments he encounters will help to both sharpen and broaden his thinking over time. I see Young Lions the same way. It reads very precious, very self-centered. Its characters don't exist in the world. Indeed, the way Larmee draws them, they look like children. However, they are adults. Cody Campbell is a boy with rosy cheeks (is that supposed to be theatrical makeup, or a comics shorthand for actual rosy cheeks?). Alice is a dark-haired girl who is apparently used to a life of privilege. Wilson, slightly older, balding with glasses, the only one who doesn't appear to be a child, is the leader of this performance art trio. Their act is not successful until they meet Holly, who faints during one of their performances, giving it a level of excitement that they had not previously had. Holly, with long blond hair, is another child-person. Now everything I've told you so far implies a fairly complex back-story. Who are these characters? How did they meet? Why have they started a performance group, and what are their goals? How do they live? Do they have day jobs? Trust funds? None of this is revealed or even hinted at in the story. Only Alice's contemptuous attitude towards being poor or living in a rural place imply a personal history. I have a 19th century need to know this information. Stories can feel a little airy if they don't at least hint at the context the characters inhabit. But it would be churlish to demand it--fiction in the 20th century has proven that such context is not required. But in the case of Young Lions, it might have helped out. As it stands, the only motivation they show is a desire to improve their act by adding Holly. (Cody also seems attracted to Holly, but not very strongly.) They don't seem bored or affectless, but they likewise don't appear to be moving in any particular direction. We don't even really know what their performance consists of--only that Holly fainting (which wasn't a performance at all) seemed to have improved it quite a bit. Larmee seems completely aware of all this. When they travel to a real place--Holly's childhood home in Florida--Alice expresses that she would like it better mediated through the experience of seeing it in a museum, decontextualized. (This issue is also a key part of Motel Art Improvement Service). The fact that they are drawn as children seems to remind us that they have no past, no experiences. But so what? In the end, I just don't particularly care about these characters. That would be acceptable if there was something else to hang onto here. But there is not. The whole book, drawn in light pencil, seems ready to blow away with the slightest breeze. This is like a lot of Larmee's writings as well. His work, in all media, is tentative. And yet, he is putting it out there into the world. He spent a lot of money (admittedly a Xeric grant) to publish this book. Let's put it this way--if I feel tentative about something, I usually keep it inside. Whether through bravery or exhibitionism, Larmee is going to grow his art in public. I think it's worth following to see where it goes. In some ways, Johnny Ryan is the opposite of Blaise Larmee. He's earthy to Larmee's ethereal, he is unreflective and Larmee is constantly thinking about theory. But at the same time, neither artist is concerned with "realism". Neither one learned from Harvey Pekar. 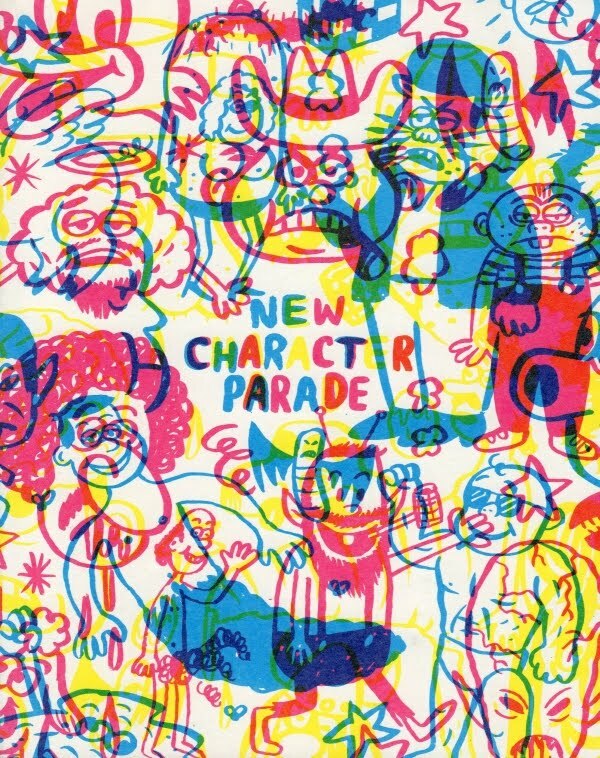 In New Character Parade, Ryan creates a new character for every page. It comes off as sort of a game--what shocking or disgusting nonsequitur can he come up with. Many of his new characters are existing characters with some twist added: H&R Cockblock, Sherlock Homeless, Rasputin on a Dirt Bike, Judge Judy Dredd, Lesbian Spock, etc. Most are extremely crude, sexual, scatalogical, etc. 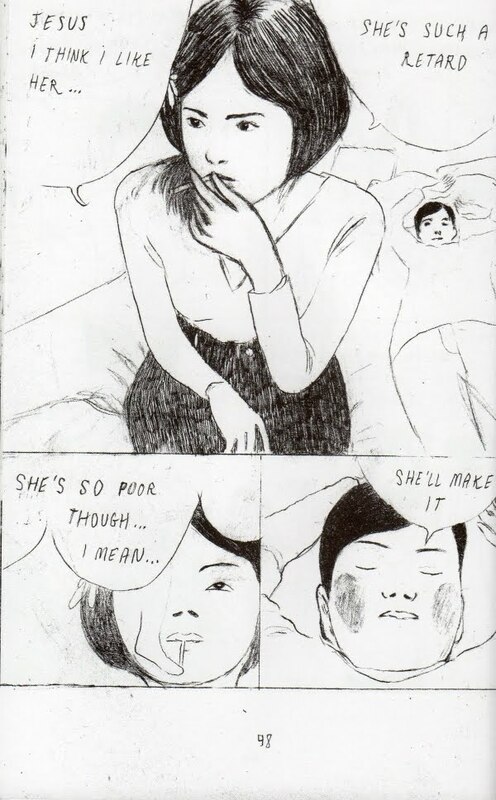 Always drawn in his manic, relentlessly happy cartooning style, which takes the edge off. 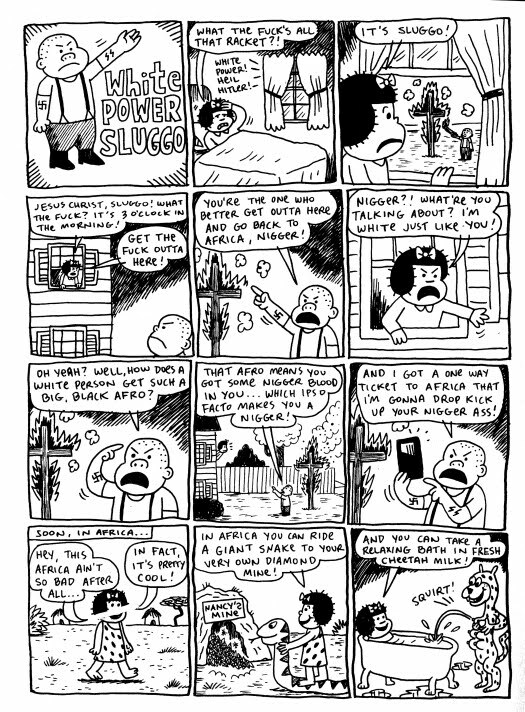 Some of them take an obvious association (doesn't Sluggo look like a skinhead? doesn't Nancy's hair look like an afro?) and runs with it. These are occasionally very funny, but reading a hundred or so at once is a bit tiring. New Character Parade is best in small doses. is blaise's fragility his greatest strength? Books I Got in Brooklyn--The End! Can There Be Good Political Art?